Colin Gordon is professor of history and public policy at the University of Iowa and a senior research consultant at the Iowa Policy Project. John McKerley is the Oral Historian at the University of Iowa Labor Center and Adjunct Assistant Professor of History at the University of Iowa. His work has focused on the rise of public-sector unions, deindustrialization, and the growing diversity of the workforce and labor movement. In November 2016, Iowa Republicans erased a slim Democratic majority in that state’s Senate, giving the party “trifecta” control of both houses of the legislature and the governor’s office. The moment the gavel struck to start the new legislative session in January 2017, they were ready with a raft of anti-worker bills, the centerpiece of which was House File 291, signed by Iowa’s then Republican governor (now Trump’s ambassador to China) Terry Branstad. Modeled on Wisconsin’s Act 10, HF 291 pushed the ALEC-inspired attack on public-sector collective bargaining to new extremes. The new law confines bargaining to “base wages” and requires public-sector bargaining units to undergo a recertification vote before each new contract, to pay for that election out of union coffers, and to win a majority of not just those voting but of the entire bargaining unit (effectively counting nonvotes as “no” votes). The long-term significance of the law remains to be seen. 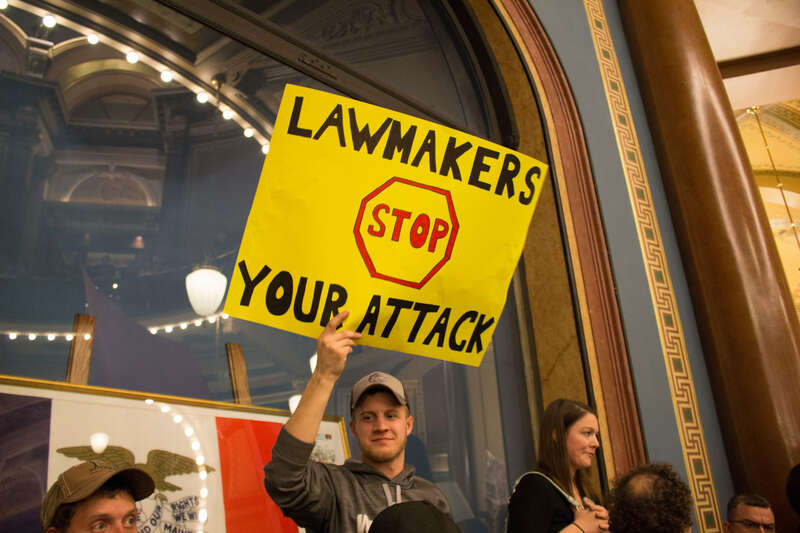 But if Iowa workers’ response over the last year is any guide, we have reason to hope that these attacks might have the unintended consequence of revitalizing the Iowa labor movement. To understand the meaning and scope of HF 291, and of workers’ resistance to it, we need to place the law in historical context. Between the 1930s and the 1960s, Iowa’s public employees had frequently joined labor unions (often organized by predominantly private-sector unions) and even negotiated with their employers on a “meet and confer” basis. These negotiations, however, had no statutory basis and were not binding under law. Their strength depended upon the dynamics of local relationships and personalities. Although Iowa did not have a statute specifically outlawing strikes, Iowa courts had ruled strikes by public employees to be inconsistent with state law. By the late 1960s, Iowa’s public-sector workers and their allies had begun to demand changes to this system, including arguing for a statewide collective bargaining statute. Facing resistance from lawmakers and powerful interest groups, especially the Iowa Farm Bureau, public-sector workers from across the state–municipal laborers, firefighters, physical plant workers, nurses, teachers, school district maintenance workers—engaged in a series of strikes between 1967 and 1970. Arguably the most important of these strikes took place in Keokuk, a river town located on the Mississippi at the point where Iowa, Illinois, and Missouri meet. In 1970, when the strike began, Keokuk was a small industrial town of 14,500. Despite its size, the town had one of the best educated teaching corps in the state, including many rank-and-file educators with MAs and PhDs. During the 1960s, these teachers, organized as the Keokuk Education Association (KEA), an affiliate of the Iowa State Education Association (ISEA), had developed a strong sense of solidarity as well as a tradition of meet-and-confer negotiations. 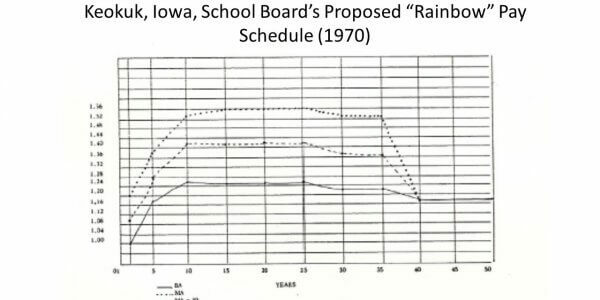 By 1970, however, they faced a school board and a new superintendent, Robert Leland, determined to roll back teacher pay in response to declining enrollments. The centerpiece of Leland’s plan was what the teachers came to describe as the “Rainbow” pay schedule. Whereas the existing schedule provided for pay grades corresponding to levels of education and seniority with some additional “merit” pay, the Rainbow schedule proposed to reverse this emphasis: between years two and five of employment, teacher pay increased each year along tracks corresponding to education level. Between years ten and twenty-five, however, all pay increases came from merit pay at the discretion of administrators. Between years twenty-five and forty, teacher pay would gradually decrease for all education levels, eventually compressing into a single, static pay scale after year forty. Leland was open about the schedule’s purpose—to reduce overall costs, in part by incentivizing early retirement. When KEA representatives rejected the Rainbow schedule, Leland and the board began to undermine the negotiations process. As negotiations broke down, Leland and the board agreed to a mediator but only because the mediator in question (a member of the University of Iowa faculty) had served as Leland’s dissertation advisor. When the mediator returned a report that advised against the Rainbow schedule as extreme and unnecessary, Leland and the board ignored the report and announced their intentions to move forward with their own proposals in the absence of any legal framework forcing them to comply with the mutually agreed upon terms of the negotiations process. Facing such threatening and unilateral changes, Keokuk teachers voted to strike. They were joined by the district’s custodial staff, who were also engaged in deadlocked negotiations with the board. The board immediately sought and secured an injunction finding that the KEA was in violation of the law. After several days in which administrators, staff, volunteers, and a few employees who crossed the picket lines attempted to keep at least portions of schools operating, the judge who had issued the injunction cited the KEA’s primary leadership for contempt of court and ordered their arrest. Unexpectedly, the image of teachers being taken to jail broke the board’s resolve, and even Leland agreed to settle. Over the course of the following night, the board and jailed KEA leaders negotiated a compromise agreement, one that did not include the Rainbow schedule. This dramatic jail-cell agreement did not resolve all the tensions between the KEA and the board. Teachers sought to advance a broad agenda that included expanding control over curricula and class sizes, even though they were willing to back off that agenda under the threat of the Rainbow schedule. Likewise, the board remained committed to cutting costs and reasserting administrative control. In the 1973-74 school year, these tensions came close to erupting into yet another strike, although the teachers succeeded in using the bargaining process to end the hated stud fee. Some Keokuk teachers, radicalized by their experience, went on to become organizers at the state level. Others took their experience to work for affiliates of the National Education Association in other states, including Wisconsin. Indeed, the Keokuk strike was arguably most important as a symbol and a rallying cry. For Iowa teachers and other public employees, it symbolized the arbitrary power of administrators and demonstrated the need for grassroots political activism to press for a statewide legal framework for public-sector collective bargaining. For many public employers and politicians, it further demonstrated the capacity for Iowa workers to engage in the same kind of disruptive (and successful) job actions that were roiling other states. This combination of grassroots activism and the incentive for “labor peace” had a particular power in 1970s Iowa. Local politicians, even those who strongly supported a Taft-Hartley framework for labor relations, represented clusters of small towns in which organized concentrations of public- and private-sector union members could have considerable electoral influence. In Keokuk, for example, the board’s decision to negotiate was informed in part by outside pressure from a citizens’ coalition made up of local clergy and private-sector union leaders. The ISEA also made use of such cross cutting tensions within Iowa’s Republican Party by hiring a former Republican staff member to lobby in favor of a collective bargaining law. After several aborted attempts at legislation, supporters of public-sector collective bargaining finally succeeded in passing a bill in 1974. A bi-partisan coalition passed the bill through a Republican-controlled House (over the objections of anti-union stalwarts, including a young Terry Branstad). It was signed by Republican governor Robert Ray, who had been calling for a public-sector collective bargaining law since 1969. The resulting legislation, the Iowa Public Employment Relations Act (which became Chapter 20 of the Iowa Code), reflected its compromise origins and the legacies of the battles in Keokuk and elsewhere. The 1974 act provided for public-sector unions to become recognized bargaining units, but it also placed restrictions on topics of bargaining. The law provided for bargaining over “terms and conditions of employment” (interpreted to mean specific “mandatory” topics, including wages, hours, insurance, dues check-off and grievance procedures), designated certain topics as prohibited topics (for example, pensions and the closed shop), and left any other topics as “permissive,” subject to bargaining upon agreement by both parties. For those instances in which (as in Keokuk) negotiations broke down, the law provided for “final offer” arbitration, in which both sides presented final proposals regarding disputed issues to an outside arbitrator, who was empowered to determine and impose the most “reasonable” proposal. The law also included a strong anti-strike provision, and a provision for the creation of an administrative body, the Iowa Public Employment Relations Board. Over the next forty years, Iowa workers succeeded in using this framework to build strong and successful organizations at the state and local levels. Although, in practice, particular unions struggled with the distinction between mandatory and permissive topics in their efforts to craft contracts that spoke to the needs of particular bargaining units, internal organizing and the threat of an adverse arbitration decision enabled workers to build strong contracts over time. By 2016, public-sector unionism in Iowa included over 1,200 local bargaining units representing about half of the state’s 240,000 state and local employees. Such organizing success helped to offset the losses to the private sector through deindustrialization, but they also made Iowa a prime target for a revived anti-union movement aimed at public-sector unions in states across the Midwest. This anti-union attack has already had severe consequences. Units have lost entire contracts. Administrators have seized on new powers to freeze pay and impose steep increases to health insurance. As in Wisconsin, some school boards have begun unraveling security clauses and replacing them with merit-pay schemes and recruitment bonuses. As is evident in the returns, public-sector workers have not only dug in their heels against the attack on their rights to bargain, but have begun to push back. The ALEC-addled state GOP, so eager to crush public-sector unions and silence their political voice, may have instead given them new organizational life. Consider some of the numbers from the September and October elections (summarized in the graphic below). Of those voting, almost 98% vote to keep the union. Of the 481 bargaining units up for recertification, 449 were retained; in 67 of these, every member of the bargaining unit cast a yes vote; in 349 of them, over 80 percent of the bargaining unit voted yes. That cluster of blue dots in the upper right quadrant of the graphic? That’s solidarity. 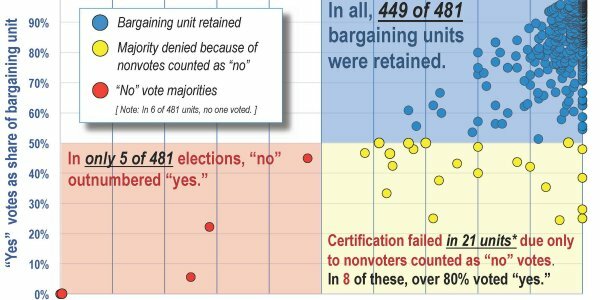 Of the 32 bargaining units (accounting for about 1,000 workers) decertified, only 5 lost the majority of votes cast; in the other 27, nonvoters—counted as “no” under the new rules–made the difference. In those elections where phantom “no” votes tipped the balance, the results are starkly unfair: At Broadlawns Medical Center in Des Moines, for example, nurses voted 74-27 to stick with SEIU 199. But, because they needed 99 votes to capture half of the bargaining unit, they lost. In the Iowa Falls Community School District, a Teamsters 238 local voted 27-0 to certify. But because they needed 33 votes to capture half the bargaining unit, they lost. As an example of the success of strong organizing in the face of the new rules imposed upon workers, Iowa State Education Association locals in 233 locations mobilized for recertification votes — winning 229 of those and losing only four by a total of 15 votes. Even in those four isolated cases, ISEA was favored by a majority of those actually voting — just not enough to satisfy the special restrictions placed on them by lawmakers. And in Keokuk, where teachers and staff had sparked public-sector solidarity over a half-century earlier, the flame still burned brightly. Last month, the AFSCME and UE locals representing support staff in the Keokuk Community School District voted 50-1 and 72-1 to retain their respective bargaining units. In the Keokuk ISEA local, representing 144 teachers, the vote was 141-2. The challenge now is to learn from the rest of the Keokuk story—to transform these election victories into a durable organizing culture capable of creating and sustaining the pro-worker policies of the future.